Daniel Ruen, the pastor at Grace Lutheran Church of Evanston, introduces “The Mask You Live In,” a documentary that discusses masculinity and gender stereotypes in America. The church hosted a screening of the film Saturday followed by a community discussion. Three Evanston churches sponsored Saturday a free screening and discussion of a documentary that deals with the ideas of masculinity and gender stereotypes in America. 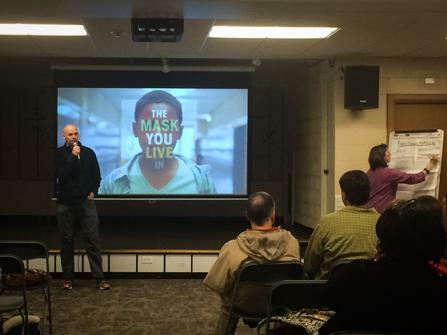 Grace Lutheran Church of Evanston, Trinity Lutheran Church and St. Paul’s Lutheran Church collaborated to present “The Mask You Live In,” a film about the struggles young men face as they confront gender stereotypes and society’s definition of masculinity. About 65 people attended the screening at Grace Lutheran Church, 1430 South Blvd., and participated in a community discussion afterward. Paula Ketcham, a member of St. Paul’s Lutheran Church who helped organize the screening, said the three churches decided to cosponsor the event after the film received a positive response when Evanston/Skokie School District 65 showed it in February. The documentary intersperses stories about males’ struggles to conform to traditional standards of masculinity, accompanied by statistics and commentary from educators, activists and experts in various fields. In “The Mask You Live In,” the commentators discussed how society and the media incorrectly associate masculinity with athletic, economic or sexual success. Portrayals of men in the media have negative effects on boys, who begin to feel they cannot do things traditionally viewed as feminine, experts in the documentary noted. For example, a young man in the film said that when he was in school, he chose to participate in sports instead of theater because he was called derogatory names for being different. Boys thus have to wear “masks” to hide how they are truly feeling, and when they grow up they cannot establish healthy relationships with others. The end of the film offered advice on how society can teach boys the right values to express themselves, stressing the necessity for teachers, parents and others to be mentors for boys so they do not turn to drugs, alcohol or violence. Bijan Warner, a co-organizer of the screening and member of St. Paul’s, said it was important to show the film because dialogue about gender roles often does not discuss boys or young men. In the discussion that followed the screening, community members shared personal stories about their pasts and their interactions with their own children. Although some said they were shocked by some of the statistics in the film, others talked about the familiarity of the problems faced by boys in the film — such as bullying and harassment — in their own communities. Raquel Olea, a single mother, said the film made her examine her own parenting techniques and helped her realize the importance of not rushing to impose gender values on others. However, Olea said people’s minds will not be changed overnight and breaking down gender stereotypes takes time, as people have a natural tendency to label others.